Square Enix announces a new collaboration with Final Fantasy XIV and Capcom’s Monster Hunter World which will be coming out this summer 2018. The trailer shows some of the featured monsters that will be making an appearance in both Final Fantasy XIV and Monster Hunter World. 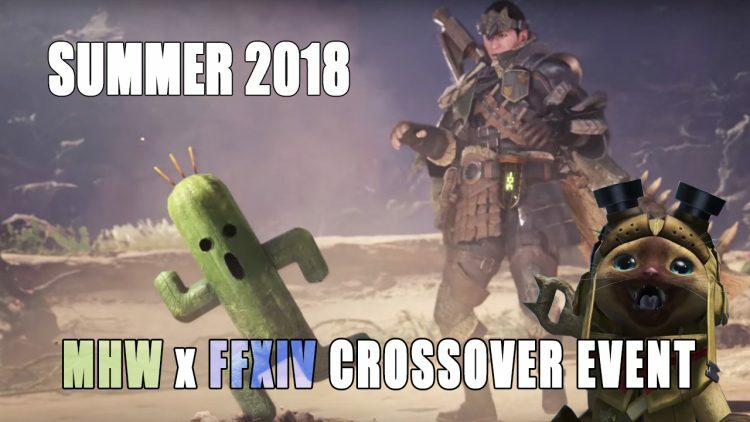 In a mashup crossover, fans of the MMO Final Fantasy XIV will be getting a taste of Monster Hunter World and vice versa as they collide in a summer event. There are two trailers which tease the monsters that will be coming to both games. A mighty Behemoth from Final Fantasy XIV crashes into the scene and confronts a hunter in Monster Hunter World. As the hunter looks on in awe, we get a glimpse of the formidable Deviljho in the jaws of the Behemoth, showing us just how big this beast is. There is also another trailer that shows the Behemoth as a Primal, players will be able to challenge the monster as a FATE (Full Active Time Event).The Cactuar is also seen but what kind of role it will take we are yet to find out. To get a good look at the Behemoth in FFXIV check out the trailer below. While there is yet to be more details about exact dates and times, we do get some information about event. It appears that wyvern Rathalos will be appearing as a boss as either it’s own Trial or as part of a MHW themed dungeon. In either case, expect to need a full team of eight to take down the sizeable monster. The exact dates and times are no where to be seen at this moment, but we get some information about how to access the event. Players will need to complete the Final Fantasy XIV Stormblood story content and reach at least level 70 in order to participate. The event will be go live in summer 2018 and will be a free update. If you are looking for more Monster Hunter World info, you can go in-depth with our featured guides: Dual Blades’ Max Element & Status Limits, All Armor Limits and Elemental Crit Build For Sealed Weapons.